Lampedusa shipwreck: Tunisian Khaled Bensalem sentenced for deaths of hundreds of migrants in 2013. 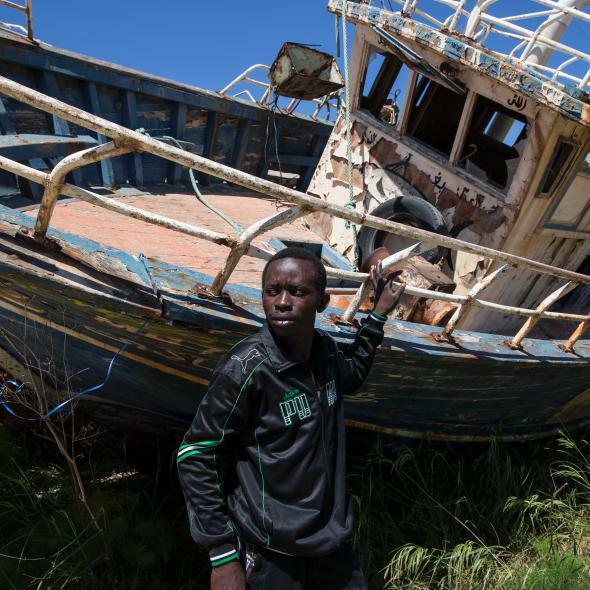 Eric Joseph, a migrant from Nigeria, stands in Lampedusa, Italy’s “graveyard” of African migrant vessels on April 22, 2015. An Italian court handed down an 18-year sentence Wednesday to a Tunisian smuggler for his role in a shipwreck that killed 366 migrants, the Guardian reports. Khaled Bensalem was arrested in October 2013 after the boat caught fire and sank near the Italian island of Lampedusa in a part of the Mediterranean Sea known for dangerous, overcrowded vessels carrying African migrants hoping to reach Europe. Bensalem’s sentence was reduced by a third from the possible maximum penalty because he was given a fast-track trial, which cuts eventual jail time for a defendant who admits guilt. Lampedusa, only 70 miles from the Tunisian coast, remains a common destination for ships filled with migrants willing to risk death to escape desperate conditions in Libya, Somalia, and other African countries. This April, a boat that had originated in Libya sank off Lampedusa, killing more than 800 and prompting the European Union to ramp up rescue operations in the Mediterranean. The EU’s efforts to reduce migrant deaths at sea will likely be tested by a dramatic uptick in attempted crossings from Africa in the coming months, according to the United Nations. On the same day that Bensalem was sentenced, the UN’s High Committee on Refugees released a new report showing that approximately 137,000 have reached Greece, Italy, Malta, and Spain by boat in the first half of 2015, an increase of 83 percent over the same period in 2014.